Belson's patented CHAR-WOOD® Flip-Back camp stove park grills feature a revolutionary design! Low-cost, durable, and vandal-proof. 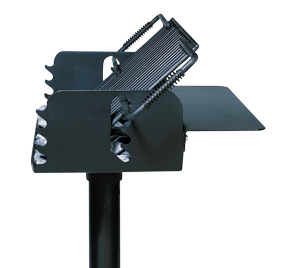 The grill grate adjusts to four different heights and flips back out of the fire area for easier fire building and clean out, yet cannot be removed from the firebox. A special swivel and locking device prevents theft. Swivel mechanism allows 360° rotation for wind draft control. 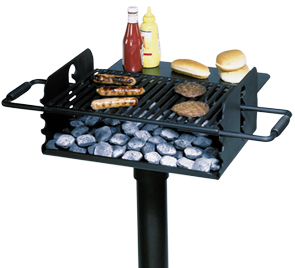 To provide wheelchair accessibility, these park grills have a 5" longer pedestal. Firebox: 3/16" steel plate with integral slots to allow grate to be flipped out of the fire area and adjusted to four different heights. Swivel Box: 4" O.D. steel pipe welded to the underside of the firebox with a special swivel and locking device to prevent campstove removal from the pedestal. Swivel device allows campstove to rotate 360° for wind draft control, but will not allow vandals to remove campstove from pedestal. Pedestal: 3-1/2" O.D. steel tubing, 30" Long with special vandal- resistant locking nut and bolt. Pedestal is to be mounted in a concrete base.